Make the dough: In a small saucepan, heat milk until just warm but not hot (100° to 110°F). Pour 1/4 cup milk into bowl of a stand mixer fitted with the paddle attachment. Stir in the yeast, and let stand until foamy, about 5 minutes. Beat in remaining milk, flour, 1/2 cup butter, 1/3 cup granulated sugar, eggs, 1 tablespoon honey, and 2 1/2 teaspoons salt on low speed until a sticky dough forms. Switch to dough hook, and beat on medium speed until dough is smooth and pulls away from sides of bowl, about 5 minutes. Cover with plastic wrap and let stand in a draft-free until doubled in size, 1 hour to 1 hour and 30 minutes. Make the filling: In a small saucepan, melt 1/2 cup butter. Cook over moderately low heat until butter turns amber and smells nutty, about 3 minutes. Whisk in 1/4 cup honey and 1/2 teaspoon salt; let cool slightly. Punch down dough and divide it into 8 pieces. Cut each piece into 6 smaller pieces (48 total). Roll each into a ball. Stir together brown sugar, 1/2 cup granulated sugar, cinnamon, and a pinch of salt. Generously grease a 10-inch Bundt pan. Dust bottom of pan with half of sugar mixture. Add dough balls, one at a time, to bowl with remaining sugar mixture; turn to coat. Arrange balls in an even, overlapping layer in Bundt pan. Pour honey mixture on top, and cover loosely with plastic wrap; let stand in a draft-free until risen to the top of the pan, about 1 hour. Preheat oven to 350°F. 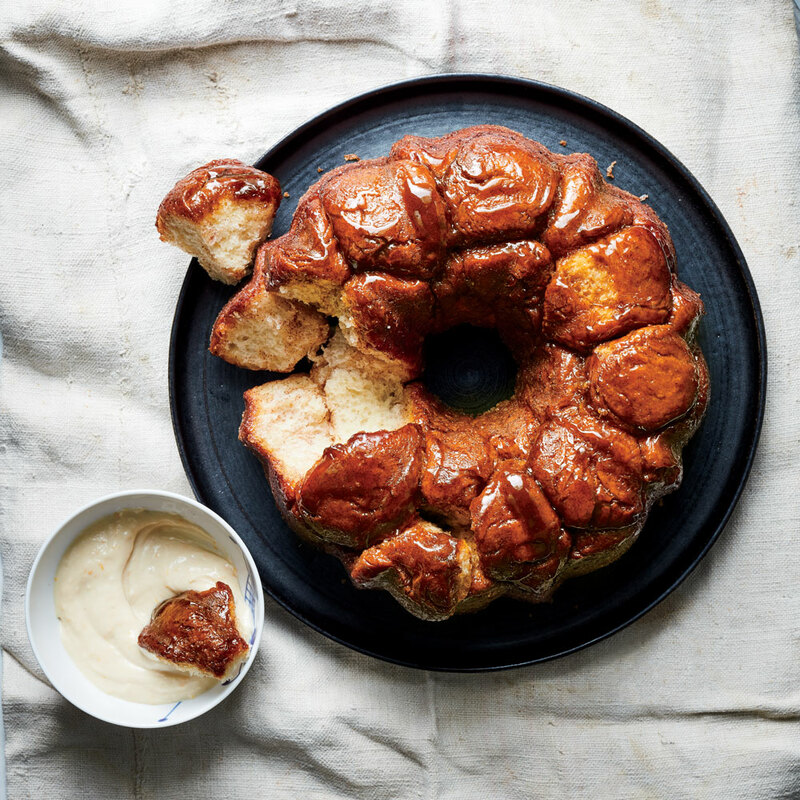 Bake monkey bread until golden brown, about 55 minutes. Let cool in pan on a wire rack 10 minutes. Set an inverted plate on top and turn bread out onto it. Let cool 15 minutes. Meanwhile, make the dipping sauce: In a bowl, whisk the cream cheese, 3 tablespoons honey, bourbon, orange zest, and vanilla until smooth. Serve the bread with the sauce.